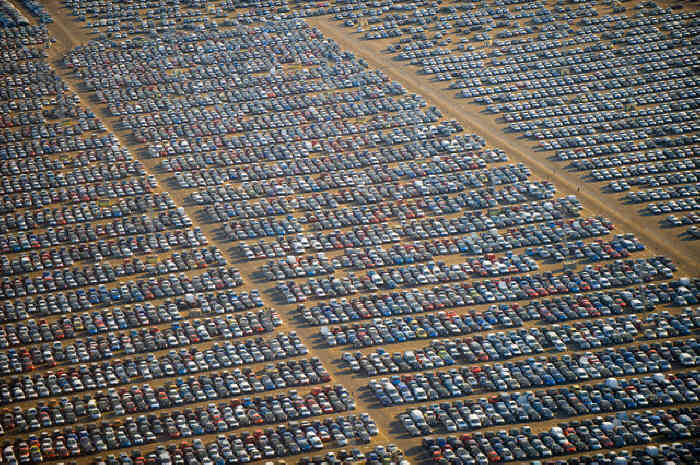 Read in Zerohedge.com about all the unsold cars in the world. New but not sold.Because less people can afford to buy new cars but car makers continue to manufacture… Go figure! ll around the world these cars just keep on piling up, there is no end in sight. The economy shouts out quite loud that nobody has the money anymore to spend on a new car. The reason being that they are making their “old” cars go on a lot longer. But we cannot stop making them, soon we will run out of space to park them. We are nearly running out of space to drive them that’s for sure! This is just one park to give you some idea of what it looks like (it happens to be in Spain) of the thousands all over the world. *shaking my head* Who ever said people are smart? Greedy sure but smart? Hell NO!